SAVANNAH, Ga. (AP) — On the heels of reporting 32 percent growth in containerized trade for October, an all-time record for Savannah, the Georgia Ports Authority approved rail and gate expansion projects that will significantly increase capacity at GPA’s Garden City Terminal – the single largest container terminal in all of North America. Georgia port officials will spend $42.27 million to untie road and rail congestion around Savannah’s docks. The Georgia Ports Authority approved work Monday that is part of a larger $128 million Mega Rail Terminal project. The board also approved a $13.2 million project to expand the existing Gate 8 at Garden City Terminal. According to GPA officials, the project will not only expand the Port of Savannah’s on-dock rail capacity by 100 percent, but position Savannah to rapidly increase service to an arc of inland markets from Memphis to Chicago. A total of $90.7 million has been allocated to the project thus far. Construction is slated to begin next month and be completed by the end of 2020. Also planned are two railroad bridges over a canal. Ultimately, the $128 million project will combine rail yards operated by CSX Corp. and Norfolk Southern Corp. The new terminal will allow 2-mile (3.25-kilometer) trains to be loaded with double-stacked cargo containers. The railroads will be able to ship 1 million containers yearly from Savannah, up from 500,000 now. The board also approved additional truck gates feeding a new connector to Interstate 95, which could take traffic off local streets. The Taiwanese ocean carrier also unveiled expansion plans in Southeast Asia and the Mediterranean amid an 11.1 percent, percent year-over-year gain in transport volumes to 1.24 million TEUs for the third quarter. Yang Ming Marine Transport Corp. recorded a net profit of 1.26 billion New Taiwan Dollars (U.S. $42 million) for the third quarter of 2017. The Taiwanese ocean carrier’s consolidated revenues for the quarter totaled NTD 35.78 billion, skyrocketing 23.4 percent from last year’s third quarter, as volumes surged 11.1 percent to 1.24 million TEUs, thanks to higher freight rates and healthier supply and demand. Yang Ming also unveiled on Thursday its plans for expansion in Southeast Asia and the Mediterranean. With board approval, Yang Ming will work on a joint investment project in Indonesia with the Taiwan International Port Corp. “to develop the shipping and logistics sectors for the benefit of Taiwan-based customers and Taiwanese industries,” Yang Ming explained. In addition, the board approved the establishment of a Mediterranean regional operating center, allowing Yang Ming to “optimize efficiency and provide customers with an integrated line haul service network in the region,” the carrier said. During the third quarter of 2016, Yang Ming was a member of the CKYHE Alliance, which also included COSCO, “K” Line, Hanjin and Evergreen Line. However, Hanjin declaring insolvency in its native South Korea at the end of August 2016 had a domino effect on the rest of the alliance members, since they shared space with Hanjin on ships. Hanjin’s collapse resulted in over $14 billion worth of cargo stranded at sea on 100 ships across the globe, according to Federal Maritime Commissioner William P. Doyle. At the beginning of this April, Yang Ming began operating as part of the newly formed “THE” Alliance, which also includes Hapag-Lloyd of Germany; and “K” Line, MOL and NYK of Japan. 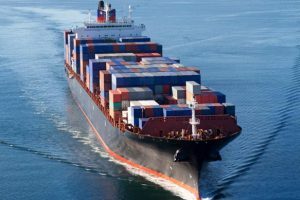 Plans for establishing THE Alliance were first unveiled back in May 2016, with Hanjin initially planning on being a member before filing for insolvency. 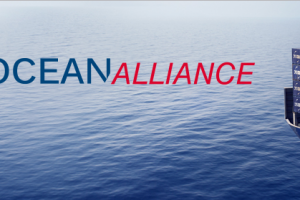 THE Alliance currently operates with 239 vessels averaging 8,764 TEUs with a total combined deployed capacity of 2.09 million TEUs across 31 services, according to ocean carrier schedule and capacity database BlueWater Reporting’s Capacity Report. In order to prevent another Hanjin incident, THE Alliance established a $50 million contingency fund that could be used if any member carrier goes through an insolvency or financial distress. Pacific International Lines’ (PIL) two new 11,800-TEU vessels, the Kota Pahlawan and the Kota Panjang, are replacing the carrier’s 8,351-TEU Navarino and 8,241-TEU YM Uniform on its AC5 service between Asia and the U.S.
Pacific International Lines (PIL) Group on Oct. 26 took delivery of two new 11,800-TEU containerships, both of which are slated to join the carrier’s joint AC5 service between Asia and the U.S. West Coast. Built by Yangzijiang Shipbuilding (Holdings) Ltd. in Suzhou, China, the two vessels, the Kota Pahlawan and Kota Panjang, are each fitted with 1,400 reefer plugs that can accommodate up to 2,800 TEUs of refrigerated containers, PIL said. PIL’s most recent online services schedules show the Kota Pahlawan joined the AC5 with the Nov. 7 sailing from Xiamen and the Kota Panjang will join with the Nov. 15 departure from Xiamen. According to Ocean carrier schedule and capacity database BlueWater Reporting, the AC5 loop deploys six vessels – three from COSCO, two from PIL and one from Wan Hai – while CMA CGM acts as a slot purchaser. COSCO refers to the loop as the SEA, while Wan Hai calls it the CP1 and CMA CGM calls it the PSX. The Kota Pahlawan and Kota Panjang are replacing PIL’s two smaller vessels on the service – the 8,531-TEU Navarino and the 8,241-TEU YM Uniform – thus boosting the loop’s average vessel capacity from 9,023 TEUs to around 10,150 TEUs. The AC5 has a full port rotation of Xiamen, Nansha, Hong Kong, Yantian, Los Angeles/Long Beach, Nakhodka and Xiamen. The service to switches off between calling Los Angeles and Long Beach, while Nakhodka is only called by CMA CGM. In addition to the absorption of OOCL’s 710,000-TEU fleet and 29 newbuild vessels slated for delivery next year, COSCO Shipping plans to order 20 new container-ships with funds from a nearly $2 billion share sale issued in October. Chinese government-owned ocean carrier COSCO Shipping could hit a total fleet capacity of 3 million TEUs by the end of 2018, which would vault it into the third spot in the global liner rankings, surpassing France’s CMA CGM, according to a new report by container analyst Alphaliner. According to ocean carrier schedule and capacity database BlueWater Reporting, COSCO and Orient Overseas (International) Ltd., which COSCO announced in July that it was purchasing for $6.3 billion, are currently the fourth and seventh largest container carriers worldwide, respectively, in terms of operating fleet capacity. The growth would come not just from the pending absorption of OOCL’s 710,000-TEU fleet, Alphaliner said, but the construction of 20 new container vessels that COSCO in October issued a nearly $2 billion share sale to finance. 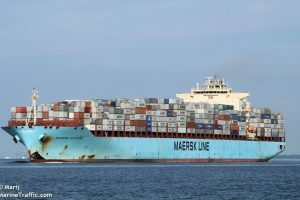 Eleven of the 20 ships being purchased are ultra-large container vessels of between 20,000 and 21,000 TEU expected to cost $140 million each. In total, COSCO has ordered 29 containerships, with the 20 ordered in October including six 21,237 TEU ships; five 20,119 TEU vessels; five 13,800 TEI ships; and four 14,568 TEU vessels. All are under construction at Chinese shipyards and all are expected to be complete by the first quarter of 2019. Just eight years ago, COSCO’s total capacity was just 500,000 TEU, but since 2009, the carrier’s scale has been driven upward by a steady influx of newbuilds and 1.4 million TEU brought over from OOCL, as well as contracts for 14 containerships transferred from China Shipping Container Lines (CSCL) after it merged with COSCO in 2016. Despite global airfreight demand slowing as the cyclical growth peak comes to an end, all major regions experienced increases in volumes for September 2017, according to data from the International Air Transport Association. Global airfreight markets in September 2017 rose 9.2 percent compared to the same period in 2016, according to the latest data from the International Air Transport Association (IATA). While this growth in the slowest pace seen in the last five months, it is higher than the give-year average growth rate of 4.4 percent, IATA said. Freight capacity rose by 3.9 percent compared to September of last year, or less than half the pace of demand growth. This is positive for industry load factors, yields, and financial performance. Though it appears that the industry has passed a cyclical growth peak, year-to-date demand growth of 10.1 percent and a forecasted growth of 7.5 percent in air freight demand for 2017 may create “significant upside potential even if the peak of the economic cycle has passed,” said IATA. “Demand for air cargo grew by 9.2 percent in September. While that’s slower than in previous months, it remains stronger than anything we have seen in recent memory. But there are signs that this demand spurt may have peaked. So it becomes even more important to reinforce the industry’s competitiveness by accelerating the modernization of its many antiquated processes,” said Alexandre de Juniac, IATA’s director general and CEO. • African carriers posted the largest demand increase of 17.7 percent; while a slowdown, it is more than twice the five-year average growth pace of 8.9 percent, said IATA. “Demand has been boosted by very strong growth on the trade lane to and from Asia which increased by more than 67 percent in the first eight months of the year,” IATA noted.